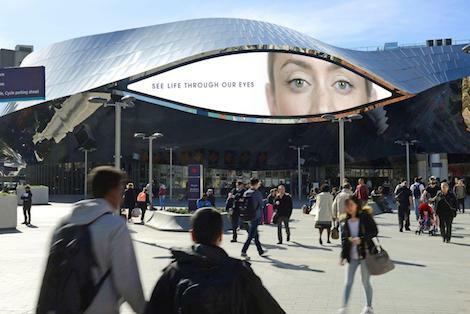 Ocean Outdoor is donating Birmingham’s unique Media Eyes to help raise awareness of motor neurone disease (MND). On Wednesday June 21, which is Global MND Awareness Day, the three full motion Media Eyes positioned above the entrances to Grand Central railway station will form the centrepiece of a day of activities about the devastating fatal disease. In a campaign created by bigdog agency in association with the Motor Neurone Disease Association, Ocean’s Media Eyes will be used to reflect the fact that many people with MND can only communicate with their eyes as the disease progresses. Using the campaign hashtag #MyEyesSay, people will be invited to share personal messages and have their own eyes featured on the giant Media Eyes, with the generated content shared wider across social media channels using #MyEyesSay and @mndassoc. Supporting content will include digital messages from MND Association supporters Benedict Cumberbatch, Eddie Redmayne and Stephen Hawking as well as a campaign video which can be seen on the campaign website. The Media Eyes activity will be supported by local volunteers and staff from the MND Association with collections inside New Street Station and with the Mayor of Birmingham Councillor Anne Wood sharing her eye message at 10.30am. The MND Association was founded in 1979 by a group of volunteers with experience of living with or caring for someone with MND. It is the only national charity in England, Wales and Northern Ireland focused on MND care, research and campaigning. The Association improves care and support for people with MND, their families and carers. It funds and promotes research that leads to new understanding and treatments, and brings us closer to a cure for MND. The Association campaigns and raises awareness so the needs of people with MND and everyone who cares for them are recognised and addressed by wider society. MND is a fatal, rapidly progressive disease that affects the brain and spinal cord. It attacks the nerves that control movement so muscles no longer work. MND does not usually affect the senses (sight, sound and feeling). It can leave people locked in a failing body, unable to move, talk and eventually breathe. It affects people from all communities. It kills a third of people within a year and more than half within two years of diagnosis. It affects up to 5,000 adults in the UK at any one time. It has no cure. This entry was posted on Monday, June 19th, 2017 at 15:26 @684 and is filed under DailyDOOH Update. You can follow any responses to this entry through the RSS 2.0 feed. You can leave a response, or trackback from your own site.